Former President Olusegun Obasanjo on Tuesday in Abuja said that Nigerians must not allow anti-democratic elements whom he refereed to as hooligans to have access to power, saying it would become a dangerous weapon in their hands. Agreeing there was no alternative to democracy, he however said that there was every tendency that anti democratic elements would abuse it. 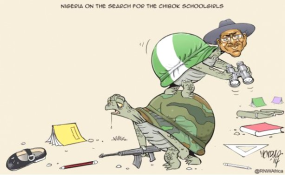 This came as former President Goodluck Jonathan revealed that the abduction of Chibok girls and lingering issue of Book Haram were used against him in the 2015 election. But President Muhammadu Buhari, former Heads of State, Generals Yakubu Gowon and Abdulsalami Abubakar hailed Jonathan for conceding defeat in the election, saying it was one singular act of kindness that largely saved Nigeria from shedding blood. The leaders spoke at a public presentation of a book titled "My Transition Hours" authored by Jonathan which captured the life and times of his government between 2010 and 2015. The book launch attracted the presence of former Heads of State, Generals Yakubu Gowon and Abdulsalami Abubakar, former President of Ghana, John Mahama, former presidents of Seirre Leone and Benin Republic, President of the Nigerian Senate, Bukola Saraki, Speaker of the House of Representatives, Yakubu Dogara, past and serving Governors of the People Democratic Party, PDP, former Ministers of the PDP, National Chairman of the All Progressives Congress, APC, Adams Oshiomole, President of the African Development Bank, ADB, Akwuwumi Adesina, former Speaker Ghali Umar N'Abba, former Deputy Senate President, Ibrahim Mantu, senator Godwill Akpaobio, Mr. Ibn Chanbers, former Governor Anambra State and Vice Presidential Candidate, Mr. Peter Obi, former Governor Jim Nwobo, former Governor Ikedi Ohakim of Imo State, the representatives of the diplomatic community in Nigeria, representstives of traditional institution in Nigeria and a host of other dignitaries. Obasanjo who was the chairman of the book launch held at the Transcorp Hilton recalled that every democrat is faced with four seasons in his life. He however said that a leader must continue to serve his people at all times. He also congratulated Jonathan on his 61st birthday. Obasanjo: "The birthday boy. I congratulate you and we all congratulate ourselves for you. I thank you for making Mr the chair of the occasion. We must also congratulate you for enjoying a peaceful retirement. You have put your experience in the book. Let me also welcome to the club of authors. From experience, there are four seasons for a democrat. "The first is when you start campaign and you are going round and everything is going well and the election comes and you win. The second season is when you take up office and all is going well and then you you have ups and downs and, of course, you came in with high popularity as you go on the popularity starts to dwindle and you lose election. The beginning of the third season is it does not matter who you are. You would have list friends particularly the fair weather friends. When you leave office, you lose office and the fourth season is when you have weathered the storm and you start up again. If you have launched this book three years ago, you wouldn't have mustered the crowd you have today. We are enjoying that life. "We have residual responsibility to continue to serve people and God and that's is the position you are in now. You and I have residual responsibility to service the public. "But when all is said and done, there is still no substitute for democracy. It fosters peace and not conflict and violence. It builds and does not destroy. It unifies rather than divide. It does. But all these happen if only democracy stands as instrument in the hands of democrats. "But We must avoid hooligans to have access to this dangerous weapons because they will abuse it." Obasanjo while reiterating the role of Nigeria in African affairs also took time to acknowledge the presence of his former Vice and presidential candidate of Peoples Democratic Party, PDP in the forthcoming election. "Nigeria has responsibility beyond its borders. For west Africa, and the world. Our responsibility must go beyond our borders. "I want to specially acknowledge the presence of my former vice president", he said. Also speaking at the event, President Muhammadu Buhari recalled the call former president Jonathan made to him to congratulate him and subsequently conceded defeat. The president said that history will judge his predecessor well. The President also called on Nigerians to eschew rancour and bitterness especially as the 2019 elections drew bearer. Represented by the Secretary to the Government of the Federation, SGF, Boss Mustapha, the president made a joke of his campaign slogan that Nigeria was going to the next level. But the joke met a swift resistance from the audience who shouted "Atiku, PDP, Let's get our country working again". Buhari: "Your singular act of placing a call to me calmed all frayed nerves. Dr. Goodluck Jonathan and I were parties to ensure that 2015 elections were violent free. History has recorded your time. History will judge you well as a patriotic leader. "I call on all to see elections as a contest based on principle, programmes that should uplift the nation. There is best level, there is only the next level. I charge you today to promote one Nigeria. You are a leader of the past, you are a leader of the now, be rest assured you are a leader of the present." In his goodwill message, Gen. Gowon thanked Jonathan for resisting voices that told him to hang onto power at the time, saying that it saved Nigeria a serious trouble. "All the speeches made here today have been wonderful. What am I to add? Let me first congratulate you on your 61 birthday. What I wan to say is that I remembered that the concern of everyone was how the election was going to go. It was serious. Then on the final day the news came that Ebele Jonathan had conceded defeated and congratulate the winner. There was such jubilation. You did something that many people have not been able to do and you saved Nigerian from a serious trouble. May God bless you for that. Thank God for what you have done. "Some of his party members were telling him to resist result. But you accepted and saved Nigeria and Nigerians. I cannot add anymore to what others have spoken. What you have done has saved Nigeria and Nigerians would ever be grateful to you", he said. Speaking earlier, Gen. Abdulsalami Abubakar said that Nigeria would remain eternally grateful to Jonathan. "On behalf of my wife, I congratulate President. We cannot thank you enough for the peace we are having in the country through peaceful transition when you voluntarily and honourably conceded defeat. You have brought peace to the is country. You became an example to Africa. You showed that loved your country more than you love power. I wish you well." Former Vice President Namadi Sambo also eulogized his former boss, saying he had written his name in the sands of time. "You have written your name in the sands of time. He has distinguished himself as a true patriot and leader and that is why we are gathered here today. Your excellency, you are a great man. ", he said. For the President of the Senate, Bukola Saraki, Nigeria's finest hour was the time Jonathan conceded defeat. "Let me on behalf of the senate congratulate you. It is Nigeria's finest hours in African Continent. As we all read the book, we all learn lesson. And we will not let it go down beyond our levels. Mr. President, the spirit of the book is what we should ensure. The spirit in the sense that no blood of any Nigerian is worth wasting. We will ensure the standard you have set", he said. Similarly, the Speaker of the House of Representatives, Yakubu Dogara said that Jonathan by making the call brought maturity into Nigerian political system. "There was silence, suspense and suspicion until he decided out of his own volition to make that gracious call and that was what changed the narrative of the country. That singular precious call you put to your opponent was what brought maturity to our political process. With that you brought honour to all those who follow you", he said. Former Minister of Special Duties, Turaki Tanimu who spoke on behalf of former PDP Ministers Forum said that Jonathan made them proud. "Today, we stand with our shoulders very high. In 2015, President kept Nigeria together without fighting a war. Abdulsalami Abubakar returned Nigeria to path of Nigeria. President Obasanjo led the strong foundation for democracy. Those of us who served under the PDP are proud of PDP achievements for 16 years. ", he said. Former Governor Babangida Aliyu of Niger State who also spoke for former PDP governors said that there were happy Nigerians had tasted two different government and can now see the different. He asked Nigerians to vote out APC in the coming election. "Many people may not understand what has happened at the time. We are all in PDP for betterment, progress and indeed, the happiness of Nigerians. When we lost power in 2015, many of us felt bad, but now we are justified. We feel good because we have given people something to compare. Nigerians and PDP members must not be afraid. Go back to your polling units, use your PVC and protect your votes.". In their separate remarks, former President of Ghana, John Mahama and former President of Sirrie Leone, Ernest Koroma said that Jonathan brought true leadership to Nigeria and Africa. For the President of ADB, Adesina who was a minister of Agriculture under Jonathan, it was an honour to have the former president as a boss. "I am proud of you. You will always be my boss. I would have been president of ADB without you. Goodluck Jonathan is a man of peace. You prevented us from going back to war. Your humility has transitioned you into greatness", he said. In his remarks, the author of the book, former president Jonathan said that the Chibok girls issue was used against him in the 2015 election. The former president also condemned vote buying which he said had become scandalous in Nigeria, asking INEC to live up to expectations of Nigerians. Meanwhile, on the sideline of the event was also the launch of Goodluck Jonathan Foundation for which Governor Sireke Dickson of Bayelsa State donated a 6 hectares of land and monthly N5 million.